Hey team players – an exciting new feature has landed at Mail Designer 365! Say hello toMail Designer 365 for Teams. This brand new feature allows you to purchase multiple Mail Designer 365 Business plans and assign them to your team members for an ultra productive team workflow. The best part? Teams has a super convenient joint billing feature. Say goodbye to multiple confusing invoices throughout the year. Regardless of whether you pay monthly or annually, you’ll receive one straightforward, summative invoice for your whole team at the end of each billing period. The Teams feature is easily accessible via your my.maildesigner365.com portal. Click on the Teams tab, where you can set up a team, enter your billing information, and then purchase and manage your Mail Designer 365 Business plans. 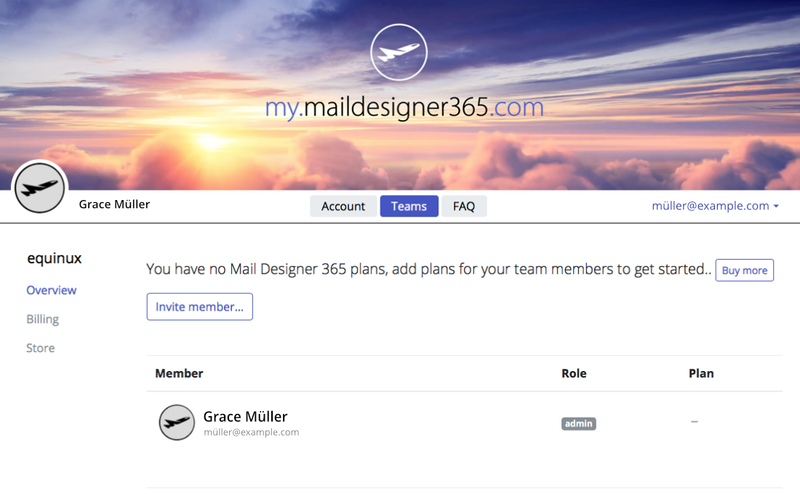 Teams is just the start of a brand new journey for Mail Designer 365. We still have loads of exciting things planned on our roadmap for 2018 to make your collaborative workflow easier and more productive than ever. Stay tuned for more! Interested in setting up a team for your business? Find out more here.